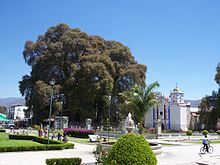 El Árbol del Tule (Spanish for The Tree of Tule) is a tree located in the church grounds in the town center of Santa María del Tule in the Mexican state of Oaxaca, approximately 9 km (6 mi) east of the city of Oaxaca on the road to Mitla. It is a Montezuma cypress (Taxodium mucronatum), or ahuehuete (meaning "old man of the water" in Nahuatl). It has the stoutest trunk of any tree in the world. In 2001, it was placed on a UNESCO tentative list of World Heritage Sites. In 2005, its trunk had a circumference of 42.0 m (137.8 ft), equating to a diameter of 14.05 m (46.1 ft), an increase from a measurement of 11.42 m (37.5 ft) m in 1982. However, the trunk is heavily buttressed, giving a higher diameter reading than the true cross-sectional of the trunk represents; when this is taken into account, the diameter of the 'smoothed out' trunk is 9.38 m (30.8 ft). This is slightly wider than the next most stout tree known, a giant sequoia with a 8.90 m (29.2 ft) diameter. The height is difficult to measure due to the very broad crown; the 2005 measurement, made by laser, is 35.4 m (116 ft), shorter than previous measurements of 41–43 m (135–141 ft). The age is unknown, with estimates ranging between 1,200 and 3,000 years, and even one claim of 6,000 years; the best scientific estimate based on growth rates is 1,433-1,600 years. Local Zapotec legend holds that it was planted about 1,400 years ago by Pecocha, a priest of Ehecatl, the Aztec wind god, in broad agreement with the scientific estimate; its location on a sacred site (later taken over by the Roman Catholic Church) would also support this. The tree is occasionally nicknamed the "Tree of Life" from the images of animals that are reputedly visible in the tree's gnarled trunk. As part of an official project local schoolchildren give tourists a tour of the tree and point out shapes of creatures on the trunk, including jaguars and elephants. In 1990, it was reported that the tree is slowly dying because its roots have been damaged by water shortages, pollution, and traffic, with 8,000 cars travelling daily on a nearby highway. ^ "The Ahuehuete Tree of Santa María del Tule - UNESCO World Heritage Centre". UNESCO. Retrieved 2010-04-18. ^ a b c Earle, Christopher J., ed. (2018). "Taxodium mucronatum". The Gymnosperm Database. ^ a b Mitchell, A. (1983). Trees in Mexico. Int. Dendrol. Soc. Yearbook 1983: 88–95. ^ Earle, Christopher J., ed. (2018). "Sequoiadendron". The Gymnosperm Database. ^ Dorado, O., Avila, G., Arias, D. M., Ramirez, R., Salinas, D., & Valladares, G. (1996). The arbol del Tule (Taxodium mucronatum Ten.) is a single genetic individual. Madroño 43 (4): 445-452. ^ a b c Debreczy, Zsolt; Rácz, István (Winter 1997–1998). "El Arbol del Tule: The Ancient Giant of Oaxaca" (PDF). Arnoldia. Arnold Arboretum of Harvard University. 57 (4): 3–11. ^ a b Pakenham, T. (2002). Remarkable trees of the world. Weidenfeld & Nicolson. ^ Conzatti, C. (1921). Monograph on the Tree of Santa Maria del Tule, tr. Ralph Summers. Mexico: Imprenta Mundial (cited by Debreczy & Racz 1998). Wikimedia Commons has media related to El Árbol del Tule. "Tree of Tule" . Encyclopedia Americana. 1920.